Household refrigerators, freezers, air conditioners and small commercial objects usually use a capillary tube. A typical setup is schematically in Fig. 4-17. Capillary tube length of pipes of small diameter. This reduces the pressure on the reduction of refrigerant to flow through its length. On Fig. 4-18 shows another type of non-destructive}- pipe refrigerant management. The tube inner diameter may vary. Diameter depends on refrigerant capacity of the unit and the length of the line. Liquid in the evaporator as the compressor operates. 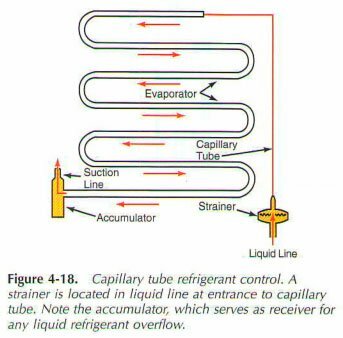 Capillary tube is placed between the liquid line and the evaporator. Enough fluid passes through the offset amount, which was evaporates. 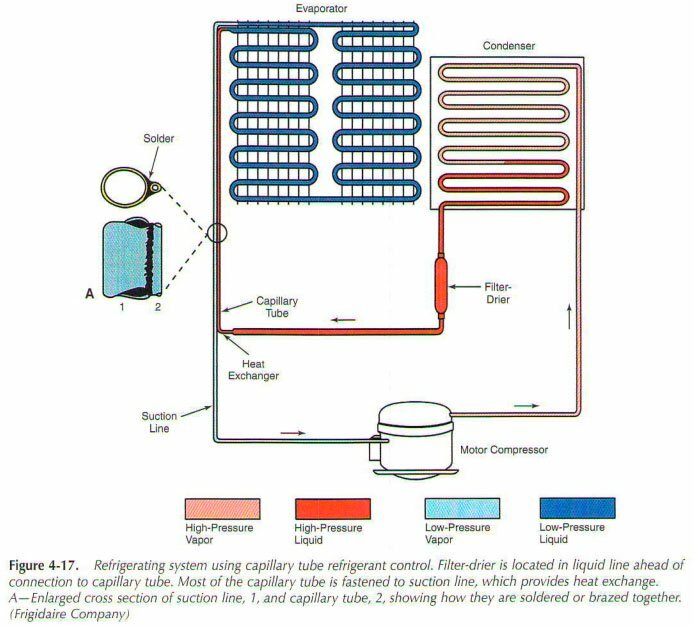 Capillary tube reduces the liquid refrigerant from high pressure to its boiling pressure. Pressure of a liquid few drops in the first two thirds of the length of the capillary tube. Then some of the liquid begins to change in par. When refrigerant reaches the end of the tube, from 10% to 20% of it evaporates. There is an increased amount of steam. This leads to a pressure drop occurs at the end of the tube nearest liquid line. Recent developments in the capillary tube design uses a larger and longer tube (20', 30'). Being larger in diameter is less likely to become connected.